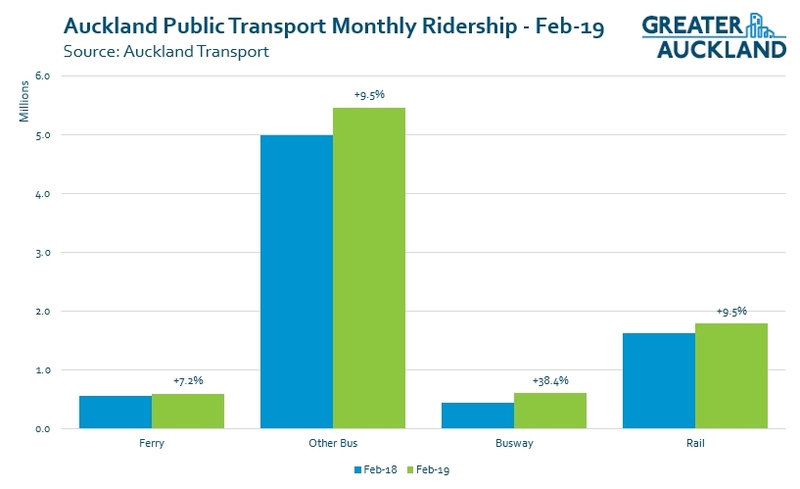 A few days after seeing that the cycleways a booming, we’ve now got the high level ridership numbers for February and like with bikes, the numbers are looking good. February is always an interesting as it is the first useful indicator for months on how PT usage is going as December and January are impacted by holidays and rail shut-downs. It was also going to be interesting to see what impact the fare increases on 10-Feb had on usage. For February this year we saw an impressive 11% increase in boardings compared with February 2018, that’s over 835,000 more. On a 12-month rolling basis we’re now at 97.6 million, up 6.5% or 5.95 million. Below you can see how the modes fared with all seeing decent growth. Once again the busway is looking great and that’s partially due to a change in how AT count it. We’ll need to wait till October to see what the full impact of these changes are but if things continue the way they are, annualised usage for the busway will be about 7.5 million, higher than any of the individual rail lines – the Western Line is the busiest with just over 7 million trips. 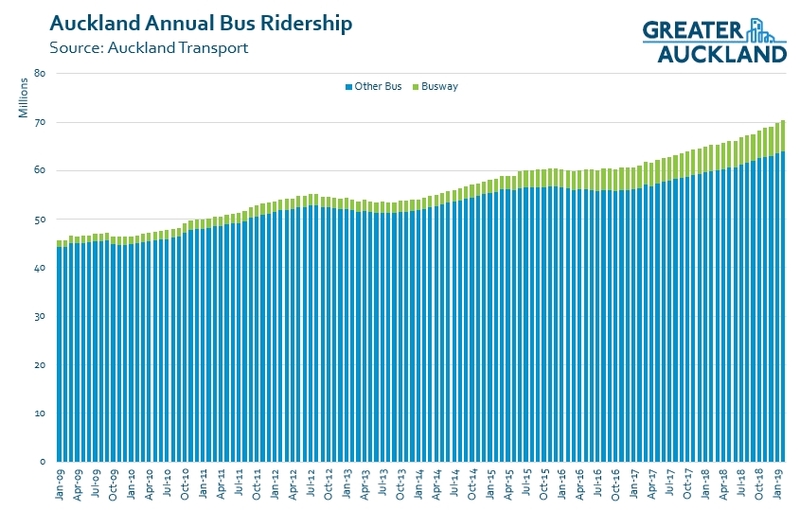 Buses outside of the busway continue to be strong too with 9.5% growth in the month which is largely related to the changes with the new network. Speaking of the new network. One thing that was expected, based on experiences overseas, was that ridership would initially dip but then come back and grow stronger than it was before. Notably in Auckland we haven’t seen that dip and if we continue to see good strong growth in the coming years it will really help see PT use grow. February’s strong bus numbers saw us pass a milestone 70 million bus trips with a 12-month period for the first time. This is up from about 46 million bus trips a decade ago and buses still make up about 72% of all PT boardings. As for rail, after a weak 2018, it’s good to see stronger growth coming back and annualised trips are just shy of 21 million. Weekend services commenced between Downtown / Beach Haven / Hobsonville on 26 January 2019. Council funding support has been minimised through a one-year funding and marketing agreement with Homes, Land and Communities (HLC). Patronage continues to be above target on the route at a weekend. Since service commencement, patronage between Downtown and Hobsonville / Beach Haven has been averaging over 500 passenger journeys a weekend compared to the initial target of 200. It’s interesting to compare this early result to those being seen in the Devonport rideshare trial which is seeing just 500-600 trips over an entire week. If we can achieve a growth of just 5%, and it seems likely, it will be the first time we’ll have had more than 10 million trips in a calendar month, at least since the trams . Here are few other things that caught my eye from ATs monthly indicators report – this is only just come out for January though. Traditionally we see January much lower than December for usage in the weekday average numbers we can see them almost the same this year. Great stuff, and cool to see that the Hobsonville is over 100% above target. 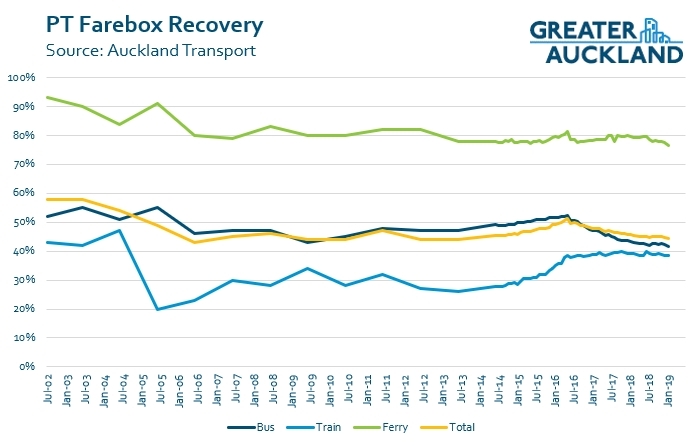 Those Farebox recovery stats for Ferries always make me mad. This morning from Hobsonville a not so big ferry will make 3 trips, running once every 75 minutes for those 3 trips to Auckland CBD and that is it. Is there room for all passengers if they wanted to use it, I really doubt it. The first ferry leaves at a leisurely 6.30 am, tough if you start work before 7.00. This is one of the most densely populated outer suburbs in New Zealand with Whenuapai now well underway with housing developments and that pathetic public transport offering is about it as far as we are concerned. What sort of barbarian would want to ride on a ferry at 6:30 in the morning. Sensible folk are still in bed. PT auckland style along with development auckland style – keep building denser and denser burbs well away from PT links. Really interesting that it took local ratepayers and developers to get involved before this came into effect. I took the ferry the other weekend and it was pretty packed with kids and parents and bikes, etc. It was great to see, and I couldn’t believe it hadn’t been done earlier. “It was great to see, and I couldn’t believe it hadn’t been done earlier.” – Copy and paste for pretty much every PT and cycling project ever done in Auckland! The farebox recovery for the non-ferries is impressive, now if the government could lower the expected to 30% or something, and make it a band, so overcharging by Fullers could not happen. Say 30-40%, like they target inflation. Too simple? 97.6 million trips, that by my rough calculations is 61 trips per person, be it newborn or 100 + years old per year in Auckland, (yes I know some take 20 trips per week and some never go near PT in a lifetime.) Awesome and it does potentially take one car off the road per person. But stats are awfully misleading and I cannot help but think if AT were used car dealers they would by far have the best salesmen on the boulevard. To accept these statistics at face value our PT is not just delivering, its rendering cars obsolete. I can’t find an Auckland break down but according to MOT 2016 NZ stat’s, “Vehicle kilometres travelled in 2016 increased by 4.6 per cent, to more than 45 billion kilometres. Each New Zealander travelled on average 9,683 km, the highest since 2007. Auckland would have to make up a fair bit of that 45 billion kilometres and that tells the story. Privately owned vehicles make up 90 per cent of vehicle movements in Auckland, while public transport only accounts for 5 per cent, according to new research from Boston Consulting Group. And if 97 million sounds so good, then the above demonstrates quite simply why are our roads so clogged every weekday and in some cases such as SH1 Albany, 7 days per week and why 97 million is a drop in the bucket. I have said it before and while 97 million trips sound just incredible, Aucklanders should not accept this piss poor alternative given to us by AT to roads if we are to get ahead. And for this, I ask yet again, where the hell is the Minister of Transport, the man of super invisibility, Phil Twyford and what is he doing about this? The issue lies in the fact that the majority of Aucklanders, once they have done their trip to and from work on PT, main option to get around is reverting to jumping back in the car, be it go to supermarket, sports or social events, pick up kids, drop them off…so all that hard work of getting people out of cars and onto PT is totally undone come 5:30pm. We need a network that allows us to use PT instead of our cars around the clock, eliminating those short frequent trips. Just who is going to take a $250 shop on PT, probably with a 15-20 minute walk at least at one end of the journey? Nobody in Auckland, therein lies the problem. I had a drive around Hobsonville, one of our densest areas in Auckland and spotted maybe one Convenience Store…no Dairies on corners, no other amenities that early 20th Century suburbs have,with shops built along Tram through fares..to visit any shop outside of the CBD in Auckland requires you getting in a car. We have x2 ‘Metro’ supermarkets in the CBD, thats it. Go to any other City and you will see Supermarkets near Transit hubs with apartments built on top. In Hobsonville for instance, surely there is a need for a small Countdown or New World metro, so that you can pick bits up on the way home. It’s not going to eliminate the need for big supermarket shops, but it offers alternatives for people. When we have become as car dependent as we are, its hard to think of a life otherwise. I also think this is one of our issues, developers make money however they can there is no imperative at this stage to make it work for sustainability. Good density includes easily accessible facilities. Yes you can’t really blame people… Most of the time there is just no sensible way to get groceries without a car. In the CBD this is really annoying, many apartments are actually pretty far away from any supermarket. I can currently drive to and park at the supermarket faster than I was able to walk to the nearest supermarket in the CBD. Meanwhile the crowding in the Countdown on Victoria Street often means hour-long waits at the checkout. It just makes no sense. There’s a Countdown within spitting distance of Hobsonville Pt. Agreed though, the tram should run through it. Countdown & now New World delivery is another option for bigger shop people & is pretty efficient really. Yes agree though town planning is all setup for the car & drive to shops in NZ. My grocieries is very back to the future actually. We order for delivery mostly, I drop in to a supermarket on my way home one a week or so if there is something else I need. Milk and stuff O get from the dairy, I live in an area that is still lucky to have one on the corner of my street. Fancy that, getting dairy from the dairy. This is pretty much why my grandparents used to do. Bulk items and fruit and veg delivered and perishables like meat picked up every day or two. same; we get the dull stuff delivered, and pick up fresh things on the way past local shops. We are lucky to live close to a number of different suppliers. I haven’t got time to drive to the shops. Oh yes and don’t forget the fresh fruit & vegetable online order companies, like Ooooby for example sources from local organic if possible suppliers. I don’t think it is a case of needing a car to do that $250 shop. It is the other way around. You do that $250 shop in one go because you need to drive. Driving to a supermarket and finding a parking spot can be pretty annoying, so you don’t want to do that too often. and less spoiled vegetables and fruit. And there are these things like panniers, baskets and shopping trollies if you still like big shopping. Agree. For a number of years Downtown Countdown was between my work and Britomart. I would grab a couple of days groceries two to three times a week. It was great for fruit and veges. thats pretty much how i get by, supermarket on way home from work most days or a seven min bike ride. Irritating that the vast swathes of ‘free’ carparking supplied are built into my grocery bill however. It’s really astounding how differently people are living their lives within the same city, isn’t? I can’t remember the last time I spent over $100 at a supermarket. I don’t believe I’ve ever spent $250. Driving a car to a supermarket – maybe once a year? Or twice? And only because I’m on my way somewhere unusual, out of my weekly habit. But I’m thankful to Chris for the reminder. Of course we approach concepts differently when we’re experiencing things differently. Exactly. In Europe it was shop every couple of days or even every day on foot or by PT. Now in NZ my wife does a big shop every couple of weeks because that is how the system is set up. This statement is simply wrong. Look at the figures that Waspman has referred to and it shows that the majority of Aucklanders don’t use PT to get to work. If that was the case there would be way more than 10% of trips by public transport. Addressing mode share change requires fundamental change and thinking that changing the way that we get to sports practice is going to fix things is wrong; it will help, but it won’t fix things. I’m not saying the majority of Aucklanders use PT, far from, I’m saying those that do, revert to car access as soon as they are home and have to go anywhere hence despite PT figures rising, car KM’s travelled also rise. People are not getting rid of cars because they are starting to use PT to commute, that is my point. And I’d wager that you’re wrong. The majority of PT trips in Auckland are undertaken in off-peak times. Put simply, the idea that PT is only used in the peak is a fallacy. As you might have realised, Twyford is also minister of other things as well, one of which is Housing, and which he is quite busy on – and highly visible on. I’ve seen him twice in the last week. There is an Associate minister of transport, Julie-Anne Genter, who is actually trained in Transport Planning, and so I would imagine that she is taking most of the load on Transport at present. Obviously, as she is a Green Party MP, the Labour-NZ First Government will not give her full Ministerial responsibility and Twyford is there as a guiding and leading hand, but probably leaving Genter to it most of the time. Does that help you understand it any better? Yes Phil is busy on housing, something it appears he failed to grasp the magnitude of during his 6 years in opposition as housing spokesman. But if that’s the excuse for his failure to notice his light rail and Skypath announcements are going precisely nowhere then we need a new Minister for Transport immediately! Waspman, you are absolutely right. The figures that you have quoted show that no progress is being made in reducing car mode share Auckland wide. Logic says that AT and NZTA have to make major changes to the way that they are doing things or the results will be more of the same. It’s currently about 57 per person (population is just over 1.7m) but yes, that’s not a lot, especially when you compare to other cities. Wellington averages about 72 and Canadian ciities are usually over 100 with Vancouver currently sitting at about 160 per person. As for the total, 97.6m trips, you have to put that into context of how we’ve performed in the past. It wasn’t all that long ago it was only 33 million trips. Things are improving but I’m sure we all wish they would be happening faster. It is useful that you have mentioned this parking increase. The AT Parking Strategy requires that they discourage commuter driving so if this has been the effect then this is helpful. The AT increase had an almost immediate effect on nearby parking prices. I believe that the Viaduct Car Park in two very quick moves shifted to a $35 early bird rate. Obviously this removes an amount of cheaper parking locally. In a rational economic market you would expect competitors to take advantage of the increase such as AT made. It is interesting to note that the casual rate for the AT car park is 25% less than that at the Viaduct Car Park. They should just match the market rate or get out of the business (and redevelop). Pricing so high as to discourage its use, while commendable, is just kicking the can down the road. They would be better off just shutting up shop, demolishing it and redeveloping it to gain in revenue (lease or sale) what would take decades to recover in parking fees. And with the decongestion and environmental benefits as a bonus. agree, and the same with golf courses. I agree with you both but sales of neither assets looks likely anytime soon, so at least an acceptable rate of return out of the car parks would be useful in the short term. Putting up prices for on-street parking in Parnell has quickly lowered demand. Obviously Parnell workers had other options, they were just enjoying the subsidy. I think there’s a purpose for keeping some parking buildings to assist a gentle modeshift while on-street parking is reallocated to more equitable uses. AT should have put prices up to this level a while ago. But better late than never, I guess. Putting up prices ensures availability for those willing to pay a price a little closer to what it’s costing us to provide it, and means there’s problem with removing the on-street spaces. Agree but an important correction, AT started to put a price on parking in Parnell, not put it up. Previously it was free of charge! Do you know what the occupancy in Parnell was, Nick? This is a move closer to matching the market rate, or more specifically not undercutting the market with what otherwise amounts to a ratepayer subsidy for commuter parking. Nick, every time I look at this site and realise just what a subsidy I am making then I feel less happy about the administration of public parking in the city. Heidi, I can’t imagine that AT selling its parking buildings will cause a rush in mode shift given that they only own 17% of the market in the city. Would a 17% overnight, or more likely over the space of a year, mode share shift be too much? I thought that you wanted 15% annual growth in PT? I am sure that most of the city public transport could accommodate such a change and this would free up motorway and aerterial roads leading to the city. Yes. It doesn’t seem we have the time for a gentle modeshift. Great outcome. +5% growth is ok; anything above 7.5% is good; and above 10% is great. Especially so when you consider the random bus strikes of late. As Heidi notes the thing now is to ensure high levels of growth are sustained. We now the CRL will give us a big 20%-ish boost in 2023-24. That however is five years away. If we sustain growth of 5% p.a. between now and the CRL then we’ve added more trips than the CRL. That’s why sustained growth is the critical goal. In terms of what can be done, continued tweaks to parking policies are one. The other is a refresh of the NN. I’d suggest this be timed for just after the CRL opens. By then NN will be 5-years old and we’ll have decent data on what has worked or not. Yes good point the strikes and NN refresh. Stu, can I suggest that this depends on your perspective. Here on the Shore we have had sustained high growth on the bus way. But that growth has not been sufficient to reduce the need for spending on the Northern motor way. This spending then curtails public transport expenditure as there is not enough money to go around. So 15% growth has been a poor outcome for the Shore in my view. Of course the CRL will have little impact on the Shore so other initiatives are needed here. I also suggest that doing nothing until the CRL is the wrong approach. There is capacity on much of the network that can be utilised. I understand more trains are due soon. Surely after many months of operation AT can tell what networks are working and what aren’t. (Surely AT won’t run the million dollar shuttle for 5 years to see if they can reduce the embarrassment of it?) Many on these threads suggest that Auckland PT is in such a poor state because of the glacial speed at which AT and NZTA work. Can I also suggest that current figures strongly suggest that if PT growth continues at its current rate congestion will only increase causing yet more demand for roads. I would much rather have an Auckland that resembles Vienna and Prague in terms of public transport models. Particularly pricing models that effectively deliver wealth back to its users because it delivers cheaper PT fares all day/ every day; extensive networks that enable many people to forsake cars thereby delivering further wealth; and the consequence of less people in cars of a better environmental outcome. This won’t happen with only nominal growth occurring. I acknowledge that someone ultimately has to pay for PT, but a sustainable transport system seems infinitely more suitable for Auckland’s future than one that is not. I do wonder sometimes if the good growth figures are, in fact, useful. The other day I caught a train which I was sure was going to be six carriages. It wasn’t. Now, I don’t know if it is usually six carriages or not but I was completely justified in thinking it deserved all six. By the time we got to the end of the line it had thinned but for a good whack of that journey it was what you’d call full. It makes me think back to the train strike last year. That was great for me. Every train I caught was six carriages. Poor frequencies, sure, but we’re used to that here, right? What you get instead is the romantic view of a train… running to time and not remotely crowded: spacious even. You can do stuff on a train like that. I don’t catch busses often enough to comment on them and most of the time I do it’s because the trains are funky so the busses are more full than usual. That being said, we’ve got to do something about people choosing to stand when there are seats available. This old man on the last bus I caught went flying and there were perfectly good seats right there. I think he was reasonably badly hurt as well. I don’t think anyone was actually standing that time but you see it all the time on the trains. Boarding passengers see people standing and think they need to stand too… and the bodies are in the way of the seats for the odd passenger who does look and see. re train: New EMU’s are being made now in Spain, so once we have them all should be 6 trains at peak at least bar the Onehunga line. Post CRL they is rough provision for 9 car sets & also higher frequencies can be achieved maybe during peak but certain on the shoulder of the peaks. re bus: Yes often people stand as they are getting off soon or to leave seats for others,but new arrivals to the bus assume they have to as there are no seats left….or don’t want the awkward walk to & squash in the back seat row. “But that growth has not been sufficient to reduce the need for spending on the Northern motor way” – or has the work on Northern motorway just done what it always has done and encouraged more people to drive? I think you are assuming that NZTA really thought about mode shift when it deciders to expand the motorway. I doubt that even figured in their thinking.